Multiple Real-Time Antivirus Software Programs running at the same time. Hello to all, You are being directed to this information as a potential issue had been identified. Antivirus information is detailed below. Note, we have confirmed the issue is occurring here at your office and there is also a chance that the the necessary GeeDee AntiVirus exclusions are also missing. (GeeDee Software Support will advise if this is the case. Missing antivirus exclusions will need to be remedied as soon as possible). This appears to be a MS Windows issue / mistake. We are still sourcing / referencing information. NOTE - Some installs of Trend Worry Free, Sophos Endpoint 10.x, ESET NO32 & WebRoot with Windows 7 leaves Windows Defender running and active as well as your nominated install of antivirus software. You are now running 2 real-time AntiVirus scans at the same time! This issue only seems to occur more often with Windows 7 presently, but is sometime occuring in Windows 8.1 / 10. 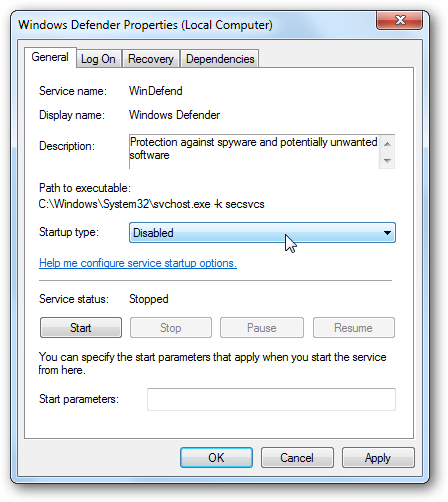 You can manually disable on each PC or via a Group Policy from your Server in one single go if on a DOMAIN. THIS WILL BE AN ISSUE FOR EACH PC. Microsoft Windows is supposed to control and prevent this from very occurring. Truly a disaster as each Real-Time System will repeatedly scan the other and lead to Windows Operating System kernel mode conflicts. This can result in Operating System issues and general communication issues across networks. Please have you I.T. people correct as soon as possible. Again, please phone if you have any further. Now, just to be clear, we’re not saying that we hate Windows Defender. Some spyware protection is better than none, and it’s built in and free! But… if you are already running something that provides great anti-malware protection, there’s no need to have more than one application running at a time. Open up Windows Defender using the Start Menu search, and then click on Settings in the top right of the window. You’ll be presented with the Settings dialog. 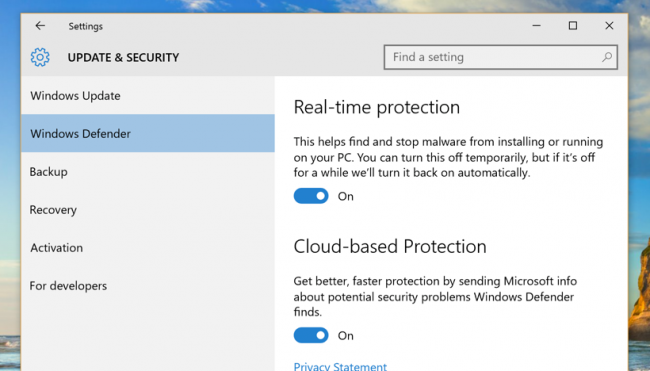 You could also get here from Settings -> Update & Security -> Windows Defender, of course. Now just toggle that Real-time protection setting to Off. You can also turn off the Cloud-based Protection item if you want. 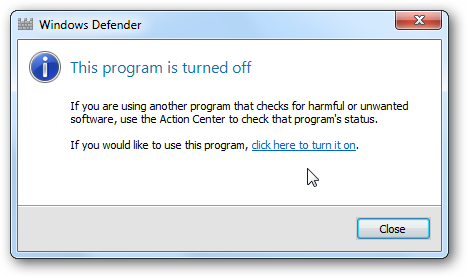 Unfortunately, Windows Defender is completely built into Windows, and you’re not going to actually uninstall it. What we can do, however, is disable it. 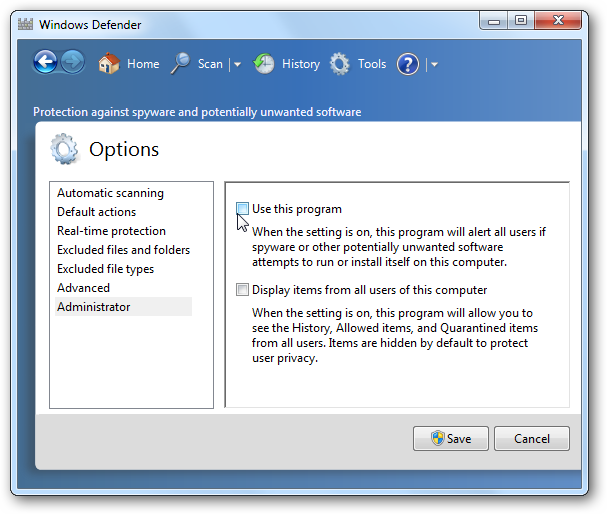 Open up Windows Defender, go to Tools on the top menu, and then click on Options. 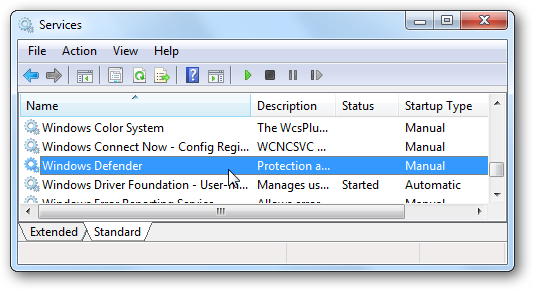 Now click on Administrator on the left-hand pane, uncheck the box for “Use this program”, and click the Save button. You will then be told that the program is turned off. Awesome! And then you can change Startup type to Disabled. Now again, we’re not necessarily advocating that you get rid of Windows Defender. Make sure you keep yourself protected from malware! You do not want to run without an antivirus. There is simply too much malware out there to browse the web without some type of protection. ref: Big thanks to How-To Geek for above technical material.